Advantages: A detailed look at JaboGeschwader 38 and its predecessors at Jever Air Base. 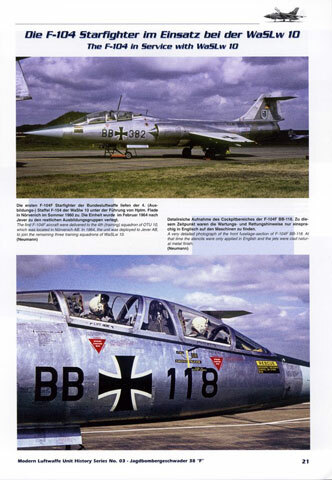 Aircraft Documentations (AirDOC), German publisher has been around for a few years now producing lovely monographs on units of the modern Luftwaffe and other air forces associated with Germany, including USAFE and RAF Germany. 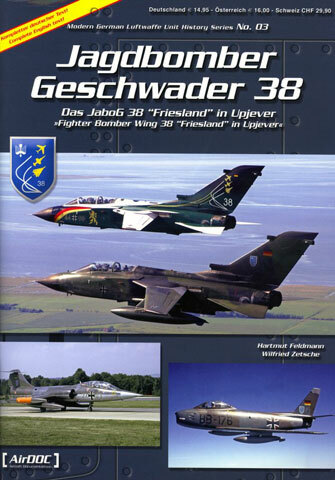 This volume on the history of JaboG 38 “Friesland” dates from 2005 and is number 3 in a series which has also include Marine MFG 2 and the “Westphalen” Fighter Wing. These publications are very professional, being printed on high gloss paper with clear, largely colour illustrations of immense use to the modeller of the Modern Luftwaffe. Unsurprisingly the main text is in German, however it is alternatively printed with an English translation on opposite columns. This makes it largely easy to read and is trouble free in its delivery. The reader is treated to more than just the history of JaboG 38, a unit which itself only dates back to the arrival of the Tornado at Jever in 1983. In successive chapters the Pre and WWII history of Jever is covered, followed by RAF occupation from 1948 and then Luftwaffe Operational Training Unit (WaSLW) 10 from 1962. As a result there is more than Tornado photograpghs to pore over. 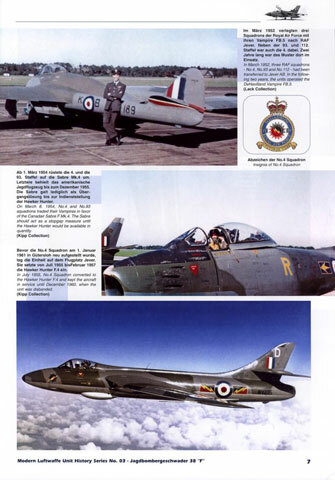 One is treated with beautiful colour photos of RAF Vampires, Sabres, Hunters and Swifts followed by an equal helping of Luftwaffe Sabre Mk5s and 6s and T/F-104G Starfighters. The bulk of the bulk then covers JaboG 38 operations right up until disbandment in August 2005. 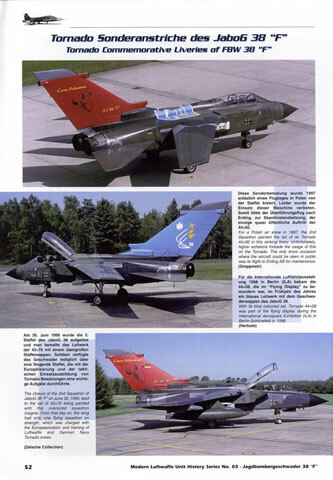 Most informed readers should not be surprised then that amongst the photos of conventionally camouflaged Tornados are some of the very colourful commemorative schemes for which the Luftwaffe is well known. This is the first AirDOC publication I have read and it sets a high standard. This is more than a volume on Tornados and modellers of the early Bundes Luftwaffe and RAF Germany will also find it extremely useful.